So many memories of the race flood to my fingertips, but the one I want to put down is the feeling of not wanting to give up at mile 25 when I felt like crap. The contents of my stomach wanted to exit, but not in the usual way. The nausea I felt was unreal. 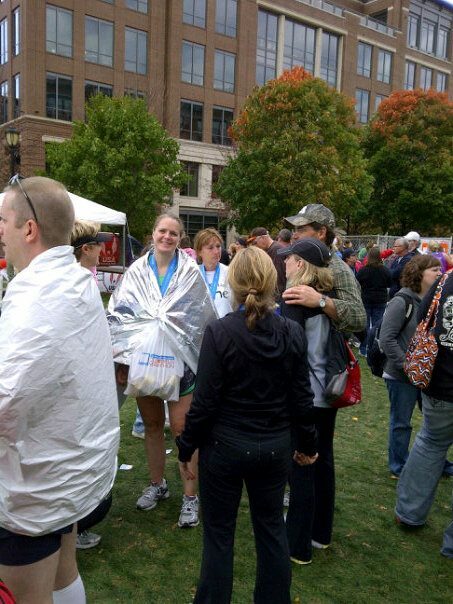 Many bends at the waist, sitting down twice, and the encouragement of friends and my husband got me to the finish line. All my friends that I had asked to support me during the race, had shown up. Kathy & Jess and mile 9 & 12, Annaliesa and her two off springs at mile 14 and 25, Ericka and the hubby at mile 16, the hubby again at mile 18, 20, 22.5, 24 and the rest of the way (he was traveling on bike), the in-laws and Brandon at mile 20, Tom and Melissa at mile 22.5, Laurel and her oh so awesome sign at mile 24. I could not have asked for better support from all of them. They all helped me get from one to the next. My legs were good and the training throughout the last 18 weeks had been solid (except for the one week I had to take off to let a shin splint make an exit). I did have some issues with my stomach throughout the two months of training. The first 14 miles went well. I was on a PR pace. 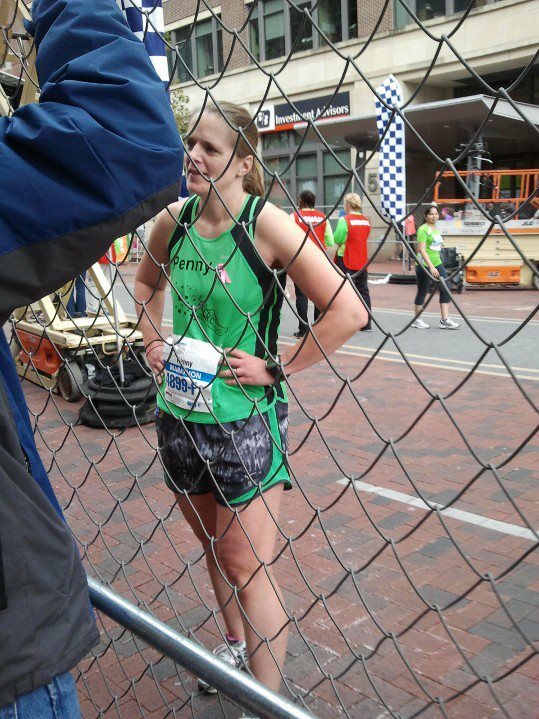 Seeing the half marathons head towards the finish line at mile 13 did make me wonder what the heck was wrong with me and why I couldn’t just be happy with running a half. I trucked on though. The crowd support diminished quite a bit after the half marathon took its leave. The haul on High street towards the OSU stadium is a long one. Once passed the stadium, at mile 16 it became really windy. And the wind was not in the back, but rather head on. This continued for 2 miles. Not fun. I tried to make myself as small as possible, which is difficult when you are 5’9″. At mile 24, I had to walk. The hubby pushed his bike next to me and the urge to get on it and be pushed to the finish line was great. But, I wanted to earn my medal the right way. Mile 24 and 25 took approximately 30 minutes each! As I came closer to the finish line the hubby and Annaliesa urged me to run the last .2 miles, which I did. Maybe the excitement or whatever, made my stomach pains seem less dominant. As I ran towards the finish line, I hollered to my sister-in law and a friend, that this was my last full. Talking with friends after the race. Overall the race was a great experience. Of course I could have done without my stomach getting really upset, but I loved the fact that my friends showed up and that the hubby was so supportive. I enjoyed the first 14 miles very much. 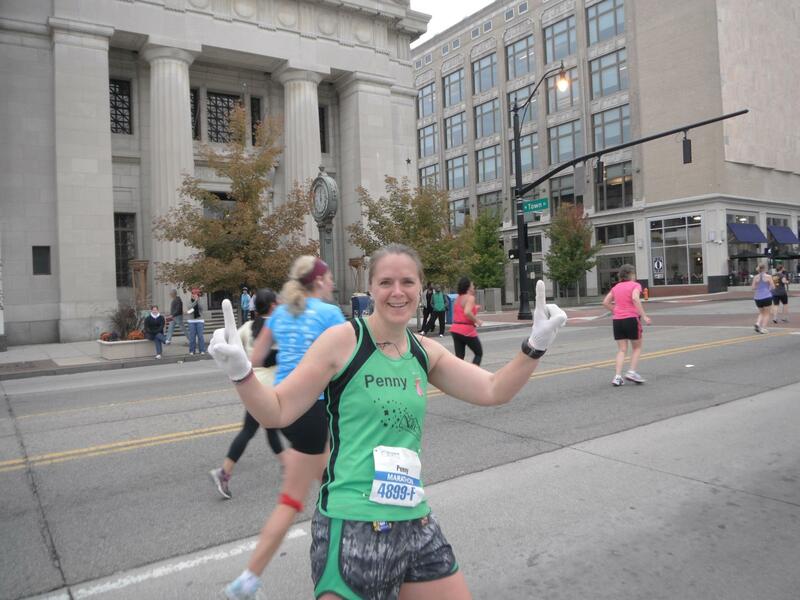 Within 24 hours after the race I decided to run the Columbus Marathon again next year, to get that PR. 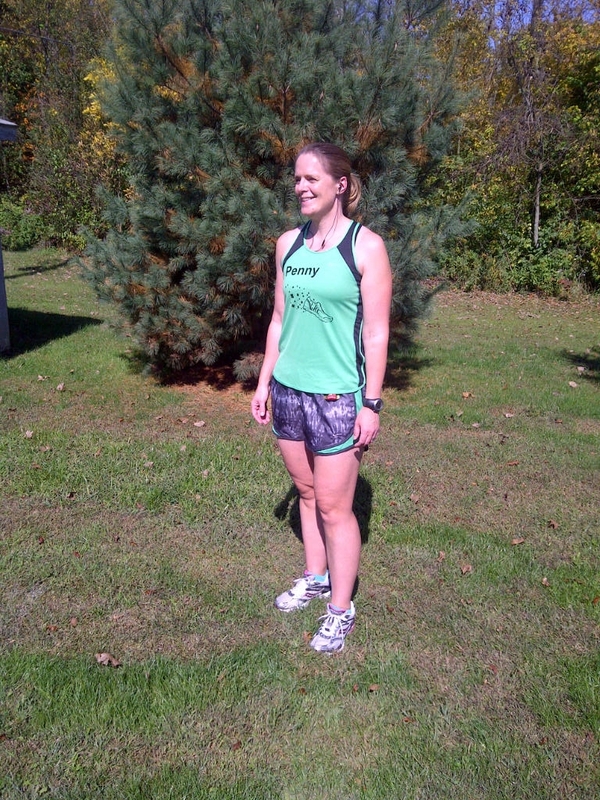 My game plan is to figure out why my tummy doesn’t like the long distances and to become an overall stronger runner. After receiving my medal and blanket. Only 350some days to go!